The chapter entitled An Overview of Intents in Android Studio covered the theory of using intents to launch activities. This chapter will put this theory into practice through the creation of an example application. The example Android Studio application project created in this chapter will demonstrate the use of an explicit intent to launch an activity, including the transfer of data between sending and receiving activities. The next chapter (Android Implicit Intents – An Android Studio Example) will demonstrate the use of implicit intents. Launch Android Studio and create a new project, entering ExplicitIntent into the Application name field and ebookfrenzy.com as the Company Domain setting before clicking on the Next button. On the form factors screen, enable the Phone and Tablet option and set the minimum SDK setting to API 8: Android 2.2 (Froyo). Continue to proceed through the screens, requesting the creation of a blank activity named ActivityA with a corresponding layout named activity_a and a menu resource file named menu_activity_a. Click Finish to create the new project. The user interface for ActivityA will consist of a RelativeLayout view containing EditText (Plain Text), TextView and Button views named editText1, textView1 and button1 respectively. Using the Project tool window, locate the activity_a.xml resource file for ActivityA (located under app -> res -> layout) and double click on it to load it into the Android Studio Designer tool. Either design the layout in Design mode, or switch to Text mode and enter the following XML. Note that the “Ask Question” text displayed on the button view has been extracted to a string resource named ask_text. As covered in An Overview and Android Studio Example of Android Event Handling, the android:onClick="onClick" resource line in the above XML listing uses an alternative way to handle simple click events without having to implement an event listener in the Java code of the activity. By specifying the onClick event type and the method to be called when such an event is detected, it is quick and easy to wire up basic click event handling on a view. Once the onClick() method has been implemented in the ActivityA.java file, it will be called whenever the button is touched by the user. 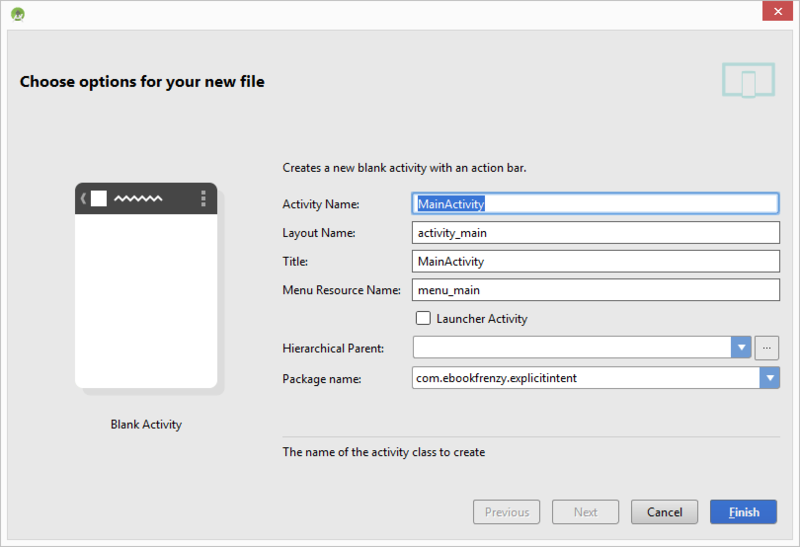 Enter ActivityB into the Activity Name and Title fields and name the layout and menu files activity_b and menu_activity_b. Since this activity will not be started when the application is launched (it will instead be launched via an intent by ActivityA when the button is pressed), it is important to make sure that the Launcher Activity option is disabled before clicking on the Finish button. With the second activity created and listed in the manifest file, it is now time to write some code in the ActivityA class to issue the intent. The code for the onClick() method follows the techniques outlined in An Overview of Android Intents. First, a new Intent instance is created, passing through the current activity and the class name of ActivityB as arguments. Next, the text entered into the EditText object is added to the intent object as a key-value pair and the intent started via a call to startActivity(), passing through the intent object as an argument. Compile and run the application and touch the “Ask Question” button to launch ActivityB and the back button to return to ActivityA. Compile and run the application either within an emulator or on a physical Android device. 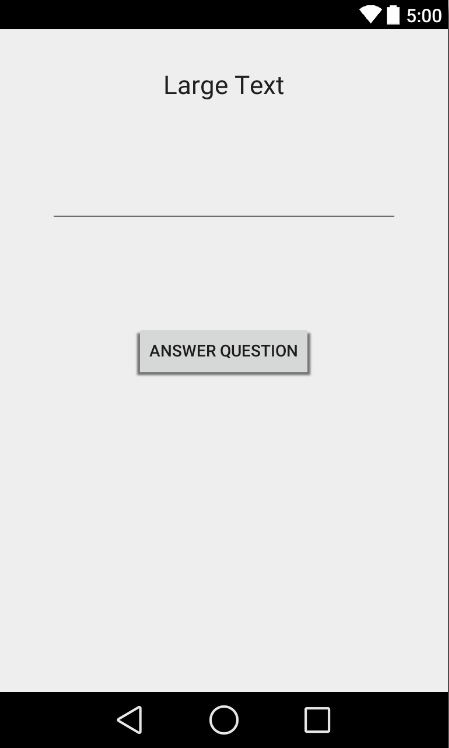 Enter a question into the text box in ActivityA before touching the “Ask Question” button. The question should now appear on the TextView component in the ActivityB user interface. The code in the above method begins by checking that the request code matches the one used when the intent was issued and ensuring that the activity was successful. The return data is then extracted from the intent and displayed on the TextView object. All that the finish() method needs to do is create a new intent, add the return data as a key-value pair and then call the setResult() method, passing through a result code and the intent object. The onClick() method simply calls the finish() method. Compile and run the application, enter a question into the text field on ActivityA and touch the “Ask Question” button. When ActivityB appears, enter the answer to the question and use either the back button or the “Submit Answer” button to return to ActivityA where the answer should appear in the text view object. Having covered the basics of intents in the previous chapter, the goal of this chapter has been to work through the creation of an application project in Android Studio designed to demonstrate the use of explicit intents together with the concepts of data transfer between a parent activity and sub-activity. The next chapter will work through an example designed to demonstrate implicit intents in action.